The Cricut Explore Air 2 is the perfect gift for any crafter. Give the gift of Cricut for Christmas, birthday or simply gift it to yourself! This post is sponsored and written on behalf of Cricut. All opinions expressed are 100% my own. Are you looking for that perfect gift for your favorite friend or family member? Do they like to craft or DIY? If you answered yes, then I have the perfect gift idea for you. And trust me when I say that the recipient will be all smiles after they open this gift! Introducing the Cricut Explore Air 2. This smart cutting machine can cut over 100 different materials including cardstock, vinyl, and even thicker materials like leather and felt. Plus the “Air” means that it is Bluetooth capable and you can create on the go without being tied to your machine with cords. 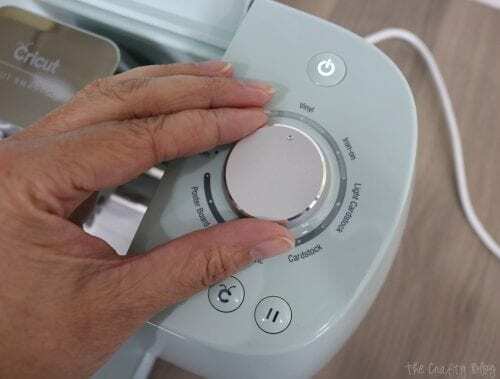 Let’s break it down into a little more detail on what this fun machine can do, and why it is the perfect gift for any crafter. The Cricut Explore Air 2 is the newest of Cricut Smart Cutting Machines and is up to 2x faster at writing and cutting then it’s previous models. Don’t have a lot of time to craft? Now you can complete a project in even less time! For a more detailed list of materials as well as settings to be used visit the Cricut Help Center. Think you are stuck with only paper crafts when using the Cricut Smart Cutting Machines? That is not the case at all! Since there are so many different types of materials that you can cut with the Cricut, the possibilities are endless! Along with Your Cricut comes a program that allows you to quickly design all of your projects. You can use the Cricut Design Space on their website, but I highly recommend downloading the Cricut Design Space App so you can design anytime or anywhere. 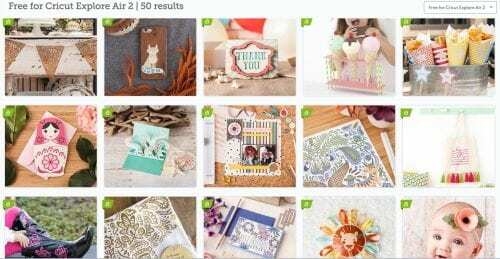 Included with the Cricut Explore Air 2 is 50 Free Projects! Just in case your friends can’t decide where to start, there are lots of different projects to choose from. All projects from design space include the level; beginner, immediate or advanced, list out the materials needed and provide step by step instructions to make sure the crafter feels completely confident in what they are creating. A common question I get is about cartridges. Link a Cricut cartridge to a Cricut Design Space Account using the cartridge port on the Cricut Explore machine. This will save all of the images from the cartridge into your Cricut Design Space account. Which means you will be able to design your project in Cricut Design Space and still have access to all of your images without having to use the rubber keyboard or having the cartridge plugged into the machine. While the complete project ideas are fun and great when you want to make something that doesn’t take a lot of time, my favorite thing about the Cricut Explore Air 2 is that I get to design my own craft projects! 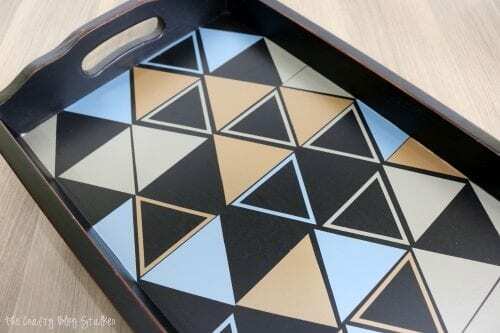 One of my most recent projects was this Diy Patterned Serving Tray. Inside Cricut Design Space, I used solid triangles and hollow triangles and created this fun pattern that I cut out using Cricut Metallic Vinyl. My new serving tray was designed and finished in no time, and I love the finished project. Want to see how I made it? Click here to see the tutorial. To purchase the Cricut Explore Air 2 simply click here. Everything you need to get started is included in the box! Have I convinced you of why the Cricut Explore Air 2 is the perfect gift for any crafter? Go here to purchase or if you have any questions please ask. I’d love to help. Or you can visit Cricut for more information. SAVE THE PERFECT GIFT FOR ANY CRAFTER: CRICUT EXPLORE AIR 2 REVIEW TO YOUR FAVORITE DIY PINTEREST BOARD! LOL! They are pretty fun Wendy! Thanks for stopping by! Love my Cricut but I have the old version. Maybe I will ask for an upgrade this holiday season! You totally should Melissa! You would love the new cricut. It is a super fun tool! Can I design stencils with it, without using the cartridges, I have vector images on my computer. Will it use those? Hi Shannon, Yes you can upload your own images for free (basic or vector). Images can be .jpg, .gif, .png, .bmp, .svg, or .dxf files and you can create stencils using any of these types of files.